Cape Town - Michael Clarke has regained the No 1 ranking in the ICC Player Rankings for Test batsmen after producing a spectacular performance in the second Test between Australia and South Africa which ended in a thrilling draw in Adelaide on Monday. The 31-year-old captain scored a masterly 230 in the first innings, his fourth double-century of the year, which has earned him 33 ratings points and has helped him leapfrog Kumar Sangkkara of Sri Lanka and South Africa duo of Hashim Amla and Jacques Kallis into the No 1 position. This is the third time Clarke has moved to the top of the table. He first achieved the No 1 ranking in August 2009 and then again surged to the top earlier this year in March-April. Unfortunately, both the times his stay at the top has been brief - a possibility which still exists as he leads Sangakkara by a slender 10 ratings points margin. If Sangakkara manages to turn around the first innings failure into a strong performance in the second innings of the ongoing second Test against New Zealand in Colombo, then he has a good chance to reclaim the coveted spot which had snatched from West Indies’ Shivnarine Chanderpaul in July. Clarke had started the year in 20th position and has made his way to the top scoring 1 309 runs to date at an average of 119. 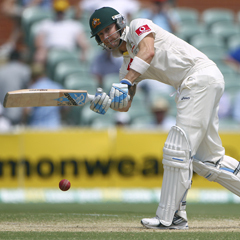 Apart from Clarke, Ricky Ponting (24th, down by three) and Michael Hussey (12th, down by one) are the other two current Australia team players who have tasted No 1 positions in the past. But Clarke is not the only player who has vaulted up the rankings. All the players who produced good performances in the just-concluded three Tests in Adelaide, Mumbai and Khulna, have been rewarded with rises in the latest rankings, which were released on Monday afternoon. Batsmen to make upward movements include Chanderpaul, England’s Kevin Pietersen, the West Indies’ Marlon Samuels and Darren Bravo, India’s Cheteshwar Pujara and David Warner of Australia. Chanderpaul, ICC’s Cricketer of the Year in 2008, has moved up to third after rising two places following his 150 not out in the West Indies’ 10-wicket victory over Bangladesh in Khulna while his team-mates Samuels and Bravo have also been rewarded for posting big scores. Samuels, who scored 260, has broken to the top 20 for the first time in his career after rising 11 places to 20th position while Bravo has gained three places following his 127 and is now in 22nd position. Pietersen was at his brilliant best on a Wankhede Stadium turning track and scored one of the finest centuries of his career by slapping 20 fours and four sixes in a 223-ball 186 that laid the foundation of England’s series-levelling 10-wicket victory. For this heroic effort, which also earned him the man-of-the-match award, Pietersen has earned a jump of six places which has put him in seventh position. This is Pietersen’s highest ranking since February 2009 and makes him the second England batsman after Alastair Cook (sixth, up by one) inside the top 10. Faf du Plessis and Abul Hasan have made dreams Test debuts in different parts of the world. South African Du Plessis followed up his 78 in the first innings with a match-saving unbeaten 110 and has entered the rankings in 56th position while Abul Hasan of Bangladesh has been rewarded for becoming the first Bangladeshi debutant to score a century at No 10 position by earning a 83rd position. There is good news for the bowlers as well in the ICC Player Rankings for Test bowlers. England’s Graeme Swann has bounced back into the top 10 after grabbing eight wickets in Mumbai. The crafty spinner has jumped six places to not only claim sixth place but has once again become the highest-ranked England bowler ahead of James Anderson (10th, down by four places). Swann’s new-ball partner Monty Panesar was in a class of his own while registering match figures of 69-15-210-11. For this marvellous performance against some of the very best players of spin bowling, Panesar has been rewarded with a jump of nine places which has put him in 29th position. Nathan Lyon of Australia and the West Indies’ Tino Best also figure in the list of biggest movers. Lyon’s five wickets in the match has lifted him eight places to a career-best 24th position while Best’s second innings figures of six for 30 was the cornerstone of his 14-place rise to 42nd spot. The drawn Test in Adelaide means No 1 position on the ICC Test Championship will be up for grabs when Australia and South Africa lock horns in the third and final Test that starts in Perth on Friday. While South Africa requires a draw to retain the Test Championship mace, victory in Perth will help Australia reclaim the No 1 Test spot for the first time since July 2009, irrespective of how the India-England Test series pans out. Meanwhile, the West Indies have earned a point on the ICC Test Championship table after winning the series against Bangladesh by 2-0. The Test Championship table will now be updated the end of Sri Lanka-New Zealand Test series.